All potential adopters complete & go through an application process. The first step is to complete & submit an adoption application. Once your application is received, it generally takes about 3 - 7 business days to get an approval status. This timeframe can vary based on how quickly we receive responses from your references. We encourage potential adopters to let their personal & veterinary references (if applicable) know we will be calling, as this helps aid in the process. Your patience with our volunteers/staff throughout this process is appreciated! Ready to get started? Click to get to the Adoption Application page. Adoption fees vary based on the pet. Each individual animal will have their adoption fee listed in their Petfinder biography at the bottom. 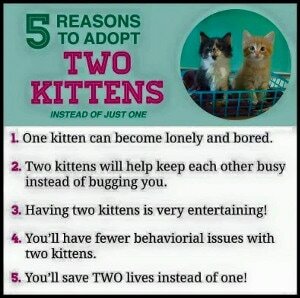 *Don't forget our Double The Love program, where select feline adoption fees are '2-for-1' at $50.00 for two! Adoption fees do include MN Sales Tax (which we are required to collect).